» The risks of self-service: Really? The risks of self-service: Really? Look, a car being fueled and no attendant in sight! Oh wait. 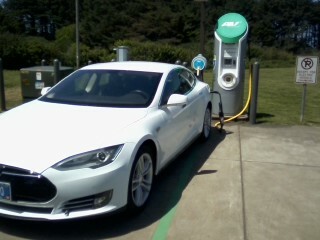 It’s a Tesla, and that hose is conducting electrical juice, not the kind made from fossilized jungles. Still, how can we allow automotive self-service when it violates all the principles the legislature set out in state law? Also among Oregon’s legal reasons for banning self-service at the pump: It would lead to less repair work available at stations, and above all, fewer jobs. None of these things played a role in the passage of House Bill 3011, which sailed through the House, twice, without a single no vote, and which cleared the Senate 25-5, with only five Democrats opposed. That curious bill allows self-service between 6 p.m. and 6 a.m in counties that now have fewer than 40,000 residents. The bill was sold on the grounds that travelers might die if they can’t find an open station in the wilds of eastern Oregon on an icy winter night. A witness mentioned Burns Junction, where he said the lone station had closed for lack of business and self-service might enable someone to open it up again. Love traveling to WA state and pumping my own gas. Can actually get a full tank pumped and it sure doesn’t seem too dangerous. Am not fond of waiting for attendant to finish a conversation before pumping or removing pump from my vehicle. Actually no difference in price either way. Can you tell I’d prefer to pump my own and I’m not a youngin either. Well, I’m old fashioned on this one. I want Oregon to keep it the way it is for three reasons primarily. 1) Jobs. Oregon’s economy is not nearly as diversified as Washington and California. These are not only beginning jobs for young kids starting out, but also fallback jobs for when folks in their 50s’ get laid off. 2) I do not agree with the argument that having gas jockeys increases prices in any significant manner. I agree it must contribute some, but overall, taxes and cost of the product have a much larger effect. I travel to California a lot for work, and Oregon gas is cheaper (I expect this is influence by CA state tax on fuel, but am not sure). 3) Again, after traveling a lot in California, I detest the gas station where there is a lone attendant, frequently behind glass, that takes your money and that is it. There is no connection, no service at all, and the gas station is reduced to something a bit soul-less. I don’t want to live in that world. Ah yes, political BS, the non-selfservice gas pumping in our state. In retirement, I have had the opportunity to travel all over the USA, pumping my own gas along the way. Was there ever a problem, NO. It is much faster to pull into a station and pump your own gas, and, you get a full tank. Safe? Yep, there is always some employee on site if you should screw up and make a fuel spill. (I have never seen that happen) I pulled into Albany Costco the other day and got about ¾ of a tank of fuel in my motorhome. No use mentioning to the gas pump jockey that the tank is not full, they yank the filling nozzle out as soon as the the auto fill cutoff shuts off. Funny thing, I pulled into the same gas dispenser today on my motorcycle. They had no desire to control the gas pump. I did the whole fueling thing from putting my credit card in to dispensing the fuel. How did I ever accomplish that when the other day I could not put fuel in my motorhome? Our state is probably the laughing stock (along with the state of New Jersey) of the rest of the United States. Oh, the safety of plugging in a electric car as you mentioned Hasso. Good one. 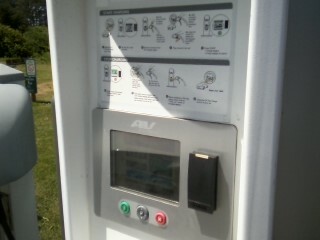 There is instant death waiting with the amperage those car chargers have. Well, I may not know what I am talking about here. I don’t know if the plug in from the pedestal to the car is AC or DC. If it is AC, it could be very dangerous. Oh, and by the way, I often wonder if the people with electric cars ever know where the electricity comes from to charge their car? Do they realize that just maybe some or all of the electricity they use is generated by fossil fuels? It may feel good to them to save the world driving a electric car, but are they? Well said with humor, Hasso. As an actual “surviving” Class 1 fuel dispensing “engineer” during my high school years (1972-73) working at a local full service gas station (the stories I could tell you about brake dust (asbestos) and compressed air would lead many to think I’m a feline on life # 9), the closest I ever came to involvement in a gasoline related “accident” was as a customer about 10 yrs. ago when the attendant (senior adult male) returned with my receipt and change after paying for my gas. I didn’t notice that he had NOT returned the gas nozzle to the pump….yep, it was still in the car’s filler neck….and logically assuming he was finished, I started my car and began to drive off. LUCKILY, the attendant yelled (“F%*#@^G idiot”) and I stopped, wondering what all the commotion and ill will was about. THEN, he continued chewing me out for being the “idiot.” That’s when I got out of the car and came VERY close to being arrested as a result of our escalating argument as to exactly which one of us was mentally deficient. This moron wasn’t worth a trip to jail so I got back in my car and drove off….and NEVER bought gas there again. Driving away from a pump with the nozzle still in the car HAS started many a gas station fire. Breakaway hose fittings don’t always work and with one spark???? Two things went wrong there. Because Oregon law prohibits “topping off” the tank, the “attendant” took one look at the amount I owed without returning the nozzle to its pump, just to save himself a few steps. Oregon law multiplied by idiocy on the attendant’s part COULD have created a very nasty situation. In fact, his “eloquence” in his use of adjectives (caused me to stop before ripping out the pump) may well have saved the day. Let’s make something clear. There IS NO TRAINING whatsoever required to work at a gas station pumping gas. This “no self service” law is ridiculous and most of the justifications for it are absurd. But anyone that thinks Oregon gas prices would fall with self-service are delusional. There will be a surcharge for customers wanting (needing) assistance. I found a very interesting, and honest, assessment of Oregon’s fuel dispensing laws at this website. It’s well worth reading and it’s somewhat humorous as well. Enjoy! I’m more afraid of getting “zapped” by electrons than of putting gasoline in a vehicle. If you become a better ground than the one provided in the equipment?????? ZAP! I hate getting “bit” by electricity. I love the no pump law. The big lie in most states who have changed their law to pump your own, was telling everyone it would be cheaper when it isn’t. I like not having to get out in inclement weather. It does provide more jobs. It really helps the elderly and disabled. It causes me pain every time have to get in and out of the car. There are many like me. Check out all of the disabled stickers in any parking lot. In CA the “full service” pumps cost more if you do need assistance, how is that fair? I agree the disabled and elderly should have someone there to assist them. It should be no different than a gas pump. You can get out of your car and walk to a store, but you can’t get out of your car and walk to a gas pump? The no-self service law is the biggest joke that Oregon has. I want to know why I can safely pump gas in California, Washington, Idaho, Montana, etc, but as soon as I cross state lines, the pumps here must be much different and more dangerous, because I can no longer pump my own gas into my own car. Instead I have to wait for some 6th grade dropout, to eventually mosy over to my car while talking on his cellphone and use his advanced hazardous materials dispensing knowledge to eventually fill my tank. I can’t tell you how many times (because of the 5th amendment) I have started to pump my own gas in Oregon (and yet not once barbecued myself) because I got tired of waiting for said highly trained professional.